Consistent with the mood of the nation all year, 2010 is closing on a down note. Fully 72% are dissatisfied with national conditions, 89% rate national economic conditions as only fair or poor, and majorities or pluralities think the country is losing ground on nine of 12 major issues. The public is especially bearish about the federal budget deficit, the cost of living, the financial condition of Social Security and the availability of good-paying jobs. At least six-in-ten say the country is losing ground in each of these areas. Smaller majorities say the nation is losing ground on the gap between rich and poor (58%), the ability to compete economically with other countries (55%) and the financial condition of Medicare (51%). The latest national poll by the Pew Research Center for the People & the Press, conducted Dec. 1-5 among 1,500 adults, finds only two issues where relatively small minorities say the United States is losing ground – international terrorism (25% losing ground) and environmental pollution (23%). Even in these areas, however, most Americans do not see progress being achieved; rather, pluralities say things are staying about the same as they have been. Yet Americans’ views about how the nation is doing on several major issues have improved since December 2008, a time when Americans expressed an even more negative view of the economy than they do today. Opinions among Republicans and Democrats also have changed substantially since then, shortly before President Obama took office. On many issues, the percentage of Republicans saying the nation is losing ground has increased, while the percentage of Democrats expressing this view has declined. This shift has been particularly dramatic in opinions about the way the health care system is working. 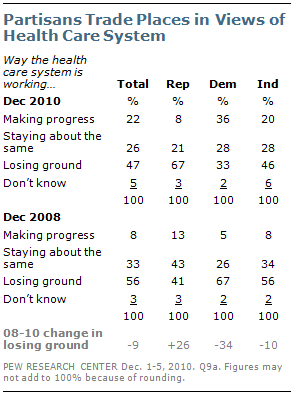 Currently, 67% of Republicans say the country is losing ground on health care, up from 41% two years ago. Opinion among Democrats has moved as sharply in the opposite direction: 33% now say the country is losing ground, down from 67% in December 2008. The survey finds that while the vast majority of Americans take a negative view of current economic conditions, many see recovery as a long way off. Just 17% think the economy is now recovering while 33% say recovery will occur soon. Nearly half (48%) say it will be a long time before the economy recovers, which is little changed from earlier this year. Jobs remain the public’s primary economic concern. Nearly half (47%) cite the job situation as the economic issue that worries them most; far fewer say the federal budget deficit (19%), rising prices (15%) or problems in the financial markets (14%). 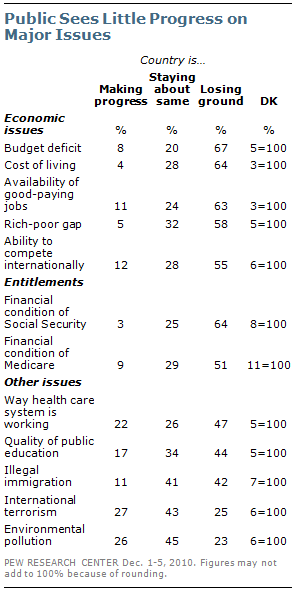 (For more, see “Deficit Solutions Meet with Public Skepticism,” Dec. 9, 2010). Perceptions about the availability of jobs, both locally among the public and in people’s line of work among those with jobs, have worsened as the unemployment rate has risen. Nearly eight-in-ten (79%) say jobs are difficult to find in their community, while just 14% say there are plenty of jobs available. In February 2008, more than twice as many (34%) said jobs were plentiful. And 65% of those working full- or part-time say jobs in their line of work are difficult to find in their community, up from 46% in early 2008. Moreover, 46% of Americans say there has been time in the past year when they or someone in their household has been without a job and looking for work. The survey finds that a majority of the public (57%) says it is very difficult or difficult to afford things they really want. About the same percentage said this two years ago (55%). And for many Americans, affording basic necessities remains a struggle – 51% say it is difficult to afford health care, 48% say the same about their home heating and electric bills, and 29% say it is difficult to afford food. 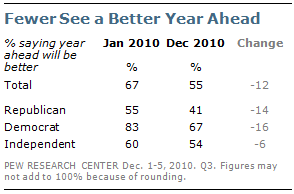 Looking ahead to next year, most Americans (55%) say that 2011 will be better than 2010, while 31% say the coming year will be worse. But there was even more optimism at the start of this year: In January, 67% said that 2010 would be a better year than 2009.